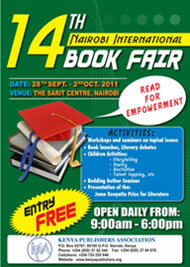 The 14th Nairobi International Bookfair fair will be held from 28th September to 2nd October 2011 at the Sarit Centre Expo Hall westland’s Nairobi, Kenya. The Bookfair is organized by the Kenya Publishers Association. The Book Fair's Theme this year is ' Read for Empowerment". Books, whether creative works or factual texts, serve as a reflection of the society from which the writers are drawn. It is therefore our duty to ensure that society is able to communicate effectively on issues that confront it and do so through books. Presentation of the Jomo Kenyatta Prize for Literature Award. This award is sponsored by Text Book Centre. Books clearance sale and raffle for books- Publishers will sell books at huge discounts. Please note that those interested in exhibiting should contact the Kenya Publishers Association secretariat for bookings.